There are many similar examples. Not everyone understands the meaning of that one, simple word. Some Christians are true disciples of Jesus, based on the commandment in John 13:34 – 13:35 (I know quite a few who are), but some professing Christians have burned innocent people at the stake in the name of love and mercy, have crushed the spirit of millions of children with repressive parenting in the name of love, or have invaded other nations and murdered millions in the name of love. Professing Christian George Herbert Walker Bush, aka Bush the First, was elected on the promise of a "kinder, gentler" nation (a more loving nation) and then proceeded to lovingly invade Iraq, bombing Baghdad into a pile of rubble and killing a great many Iraqis who had done nothing whatsoever to the United States. Why do such things happen? Pain is the ultimate cause; traumatic levels of early pain (mostly from a lack of love) cause repression of that pain and subsequent (but unpredictable in form) harm to the person's ability to connect with various types and levels of feeling. This can prevent people from understanding the true nature of love. It can cause a background emotional tone of anger, rage, fear, grief, or other emotions that powerfully affect the person's adult behaviors and philosophies. Well-known studies [PDF] have shown that repressed feelings can also cause major and in many cases eventually fatal physical symptoms from cancer to heart disease, as well as unhealthy or anti-social behaviors. Because "love" and "compassion" are attractive to people, the State and the power elite who benefit from State aggression have learned to use those words to justify their actions. No matter how cruel, disruptive, uncivil, violent, dishonest, or otherwise harmful State action may be, it is always justified, at least in part, as being "compassionate" or "necessary" (necessary also meaning compassionate, because if we don't do the "necessary" things, like molest your children at the airport for security reasons, Something Bad will result). Until there is a lot more love in this world, the understanding of love will remain elusive among the general population. This is why expanding on the idea – explaining it, providing examples and insights, and looking at love from different perspectives, is necessary. 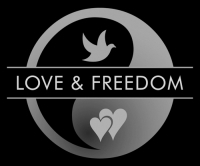 In particular, it is important to describe how freedom (the unyielding non-aggression of true liberty) not merely benefits love but is necessary for the survival of love. The toxic paradigm of Left-Right Statism has corrupted people's understanding of liberty and compassion, teaching, wrongly, that the two qualities are separate and even at odds. In fact, liberty is the environment in which compassion can thrive (the opposite environment being a police state or prison, so how hard can this be to understand, really?). Likewise, widespread emotional health provides the compassion and sanity necessary to prevent a madman like Hitler (or merely a slow, corporatism-fueled drift into tyranny) from fooling millions into cheering on their own enslavement. Freedom and compassion for children (and gentle birth practices and everything else conducive to an affectionate, healthy early life) are the bedrock, critically-necessary foundation for any improvement in society-wide emotional health – and thus, for love and freedom. It all begins at the beginning. One more point: there are many other, practical things needed for civil society: industry, dispute resolution services, regulation to protect the environment, and the entire fabric of any real-world society. All of these things – every such tool and technology and social form, without exception – are the natural and unavoidable result of free and compassionate human beings responding to the world around them. If people need it, they will create it, and you can't stop them – except by means of coercive government, which gums up the works, slows things down, moves action in unhealthy and corrupt directions, and eventually, given enough time, reverses the trend towards civil society. This reversal is now on display in the United States and other formerly-almost-civil nations. When enough people understand the unified, mutually-dependent nature of liberty and compassion, then, and only then, will mankind regain the path to a healthy, prosperous, and compassionate society. Love is the answer, the only answer, and our job – as human beings, not simply as members of this movement or that – is to convey that truth as clearly and with as much detail and repetition as needed until the idea itself, the paradigm of liberty and compassion, the Doctrine of Love and Freedom, have taken root in enough minds and hearts to shake the world free from the coercive elite's toxic paradigm of Left-Right Statism, which denies the connection between those qualities and sets them against each other. Love. That's the most compact description of what humans are made for, and the end-point, the goal, the prayer: Love. Get it into as many minds as you can. Glen Allport articles at S-T-R are my favorites!